-filter tray on top with floss to catch debris. So this is the start of my new nano reef, the old 10G all-in-one has been retired. I am going to try to add a picture every week to show the progress of the tank. The tank has been set up for 2 weeks now because I wanted to make sure I wouldn't have a mini cycle. 50% of the water and all the LR came from my 10G tank so everything was already cured and stable. Last night I conquered my rock work armed with only a hammer and 2 part epoxy. I like caves and little crevasses with light pouring through so of course the rock work took me like 3 hours. With that all done I had a huge mess and a very cloudy tank. I decided to call it a night and let the dust settle. 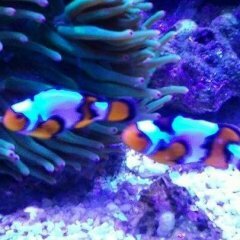 Today I make the big move, my 2 clowns, all the clean up crew and my coral all going to their new home. I did a quick 15 min acclimation on my clowns in a Tupperware container and they are doing great. I moved the coral over one piece at a time finding just the right spot. Most of my coral is sitting on my frag rack i made waiting to be placed because I forgot to restock my super glue gel. my open brain finally got it's own spot on the sand after being all cramped up on a rock in the 10G. My torch coral found a nice home below the return jet " far enough away from any future coral ". The others are resting here and there waiting to get their butts glued to a rock or moved to the prop tank. Nice aquascape, be watching this one. Hey, I realy like what you have done with that rockwork!!! So I want to understand (sorry noob questions) how you got it the way you wanted it. Is the best way to do this is by getting the rock shapes how you want them by hammer/chissle and then creatine the aquascape outside of the tank with the glue, let it firm up a bit and move it all at once? Is that about right or am I WAAYYY off? All my rock was fully cured and moved directly from my old tank to the new one. I only kept it out of the water for like 2 seconds to avoid any die off. The best way i have found to aquascape is to chisel,chip and cut the rock outside the tank but most people i think just move them around while they are in the tank. I used Loc tite 2 part waterproof clay epoxy at all the wobbling spots to make everything more secure. It looks like crap for a few months but after that the coralline covers it and it looks just like the rocks. The way I did mine was to just keep moving pieces around until they just seemed to fit snug. I went into it knowing i wanted a cave with a open top to let light through and a sand bed in the middle and that's what i came up with. When you go to the LFS to get rock it helps to have a picture in your mind of what you want to end up with, hell draw it out if you need to and take it in with you. They may look at you weird but meh... They don't usually know anything anyways. As far as tools go grab a pair of glasses,hammer,chisel and a high speed cutting tool works well but not needed. 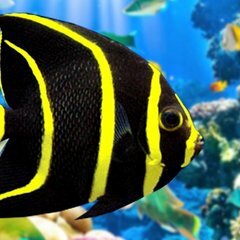 The main things I would say to watch out for is make sure your rock is stable on the bottom of the tank not just sitting on the sand and don't add too much rock cause you need to leave room for the rocks your coral come on. Oh and leave room around the edges for your magnet cleaner if you have one. If you don't.....get one. Just tear a piece off mix it and put it right in the water and mold it where you want it. Hey thanks alot, Sorry for no responce in a whiel. My wife and I just had our first baby, and as excited about my future tank as I am, baby comes first! Any, so I just after I mix it I can build the rock work in the tank? Yep build it the way you want it and then fill in the wobbly spots with the epoxy putty. I really like the aquascaping, where did you get the live rock and roughly how much is in there? Got it from the LFS $$$ rip off. and about 3" up from the bottom in chamber 2 also. What is that blue stuff? I want. The white is epoxy to hold the rocks steady.Coraline algae grows fast on it for some reason. It will all be covered within about 3 months. The blue is light that is finding it's way through a opening in the rock work. Looks gorgeous! I don't know why someone hasn't come out with coraline-colored epoxy. Would make things a lot easier wouldn't it? Me too, no one here in peoria sells coral anymore so i haven't got anything new lately. Great place, nice clean store good selection and pricing. Not much selection for LFS's south of Chicago. Got a Clam and a Monti frag. Looking to start balancing the color out a bit. Lots of green in the tank now. I don't know why someone hasn't come out with coraline-colored epoxy. Would make things a lot easier wouldn't it? Im gonna have to get some of that. I wonder if you could mix like food coloring or something with the white putty? As long as it is natural food colouring, I don't see why not. The only thing I could envisage is that it would be hard to get the dosing right - you don't want it leaching out and staining your aquarium silicone. Thats what I was thinking. Maybe I will test it out in a cup of water change water this weekend. Hey man that tank is looking good. Nice score on that clam btw. I'll be keeping up also.